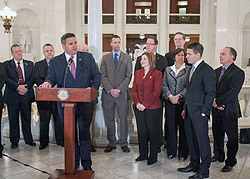 Rep. Kerry Benninghoff (far right) today attended a Capitol news conference unveiling legislation to completely eliminate the Pennsylvania Turnpike Commission and fold its responsibilities into the Pennsylvania Department of transportation. HARRISBURG – On the heels of recent pay-to-play corruption charges brought forward by the state attorney general against several high-ranking Pennsylvania Turnpike officials, Rep. Kerry Benninghoff (R-Centre/Mifflin) today offered his support at a Capitol news conference for legislation that would abolish the discredited commission. House Bill 1197 would establish a new Bureau of Toll Administration within PennDOT to take over responsibilities currently handled by the Turnpike Commission. PennDOT would honor collective bargaining agreements already in existence between the Turnpike Commission and its employees. The Commonwealth would take over responsibility for the Turnpike Commission’s debt and use toll revenues to pay off that debt. The proposal comes after a 44-month grand jury investigation led to charges against current and former Turnpike Commission top employees. The charges stemmed from allegations that the workers operated a “pay-to-play” scheme by rewarding campaign contributors with lucrative contracts. House Bill 1197 was referred on Tuesday to the House Transportation Committee.